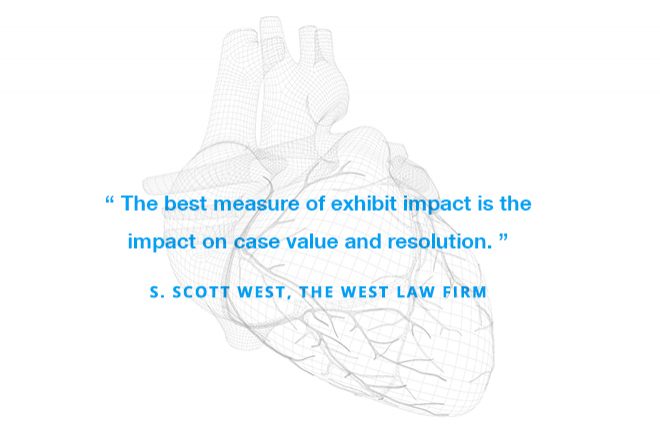 Attorney S. Scott West of the Texas-based firm, The West Law Firm, attained two substantial verdicts on behalf of his deserving clients after they underwent extensive and invasive surgeries. West knew that if a significant verdict was to be won, that he would have to accurately depict the injuries sustained by his clients, the procedures performed, and the painful recovery process that followed. Attorney West promptly contacted DK Global to produce an animation for his cases that would bolster his position as he sought justice on behalf of his clients. DK Global poured through operative reports, regularly consulted professionals and experts, and reviewed patient testimony to ensure that all aspects of the procedures and recovery were effectively animated. Attorney West was aware that a jury would find it difficult to comprehend the elevated language the operative reports contained and strove to create an empathetic connection between the viewer and patient through the method of visual storytelling. DK Global’s team of talented animators recreated the invasive nature of a spinal repair procedure, an intricate augmentation that repaired a torn ankle tendon, and the intricacies involved in stabilizing a knee injury. Attorney West was not satisfied with simply relating the surgical procedures, he also wanted to be sure that the jury understood how these surgeries were potentially complicated by the patients’ elderly ages. Armed with DK animations, Attorney West was able to effectively argue on behalf of his clients and successfully connected the jury to the unfortunate circumstances his clients experienced. As a result, he achieved a $270,000 and $250,000 judgment on behalf of his clients, when only $20,000 and $30,000 was originally offered as compensation, providing his clients with financial stability as they continue to acclimate to a life of recovery.